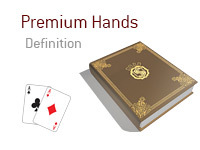 What are "premium" hands in poker? 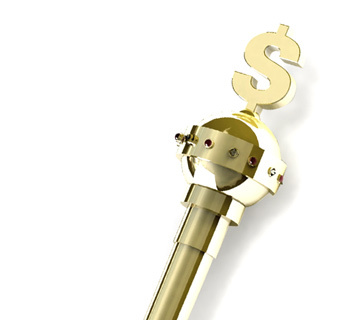 What is the definition of the term "premium hand" in poker? In poker, "premium" hands are the strongest possible hands. For instance, a "premium" pre-flop hand in No Limit Hold'em would be a hand such as pocket Aces, pocket Kings or pocket Queens. These are "premium" hands that will be ahead of virtually any other hand pre-flop. "Premium" hands will vary depending on the game. For instance, in Pot Limit Omaha, a "premium" pre-flop hand would be something like AAxx double suited. You are playing in a $1/$2 No Limit Hold'em game at your local casino. There are a number of very loose and aggressive players in the game, but you only brought two buy-ins with you, so you have vowed that you will only play "premium" hands pre-flop such as pocket Aces or pocket Kings. The problem with this strategy is that the only players at the table recognize how tight you are playing and actively avoid you anytime that you are involved in a hand.